Spending long periods of time on your feet ins’t the only culprit. Chronic venous insufficiency (CVI) doesn’t always present as pain. Sometimes, individuals will experience intense itching and tingling in the legs or feet, usually at night when laying down, or during the day after standing for long periods of time. 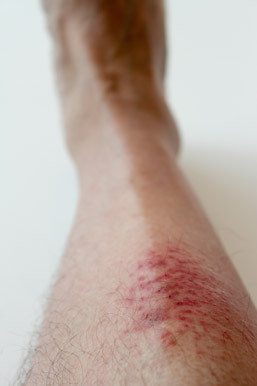 Itching is the result of excessive blood pooling in the legs. The blood that collects in the legs is low in oxygen and high in lactic acid, metabolites and other free radicals, which creates a toxic environment. Skin cells in the area are unable to regenerate properly because of the lack of nutrition they receive and the result is itchy skin that can become flakey or leathery looking. Women over the age of 50 are most commonly affected by chronic venous insufficiency and symptoms like itching legs; however, a family history of CVI, obesity, pregnancy and high blood pressure can increase odds of developing the condition. CVI is more often seen in individuals who spend majority of time on their feet, such as EMS workers, food service employees or retail professionals. The condition can also develop in individuals who live a particularly sedentary lifestyle. To sooth itching legs, your doctor may prescribe an anti-itch ointment that can be applied to the surface of the skin for fast relief, especially when legs itch at night. Elevating the legs for 15 to 30 minutes a day, several times a day and wearing compression stockings may also help to reduce pressure and itching. Ultimately, the underlying CVI condition must be addressed to fully alleviate related symptoms. There are several minimally invasive procedures available for the treatment of chronic venous insufficiency, including endovenous radiofrequency ablation (RFA), ambulatory phlebectomy, and ultrasound guided sclerotherapy. If you believe your itching legs may be related to CVI, schedule a consultation today to learn more about treatment options.